Published (June 21, 2016). MSF: Médecins Sans Frontières/Doctors without Borders. MSF Internal Review of the February 2016 Attack on the Malakal Protection of Civilians Site and the Post-Event Situation. There are strong indications that external military forces were also involved in the fighting. The violence and ensuing fire caused the destruction of large swathes of the camp (35 percent of shelters were destroyed) and left between 25 and 65 people dead (including two MSF staff), 108 injured and over 29,000 IDPs displaced once again. This report constitutes the findings of an internal review conducted by Doctors Without Borders/Médecins Sans Frontières (MSF) into those events. The review aimed to provide lessons learned from MSF’s medical emergency response, as well as to help better understand the circumstances around the events and the role of the different actors. The findings exposed a glaring failure on behalf of the UN Mission in South Sudan (UNMISS) to protect the civilians residing in the PoC site. 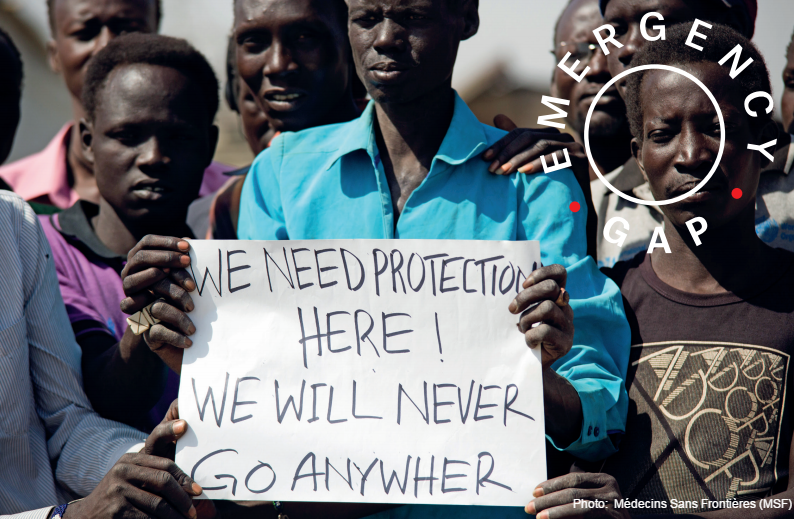 By not ensuring that adequate preventive measures were taken, failing to act to stop the violence in a timely manner, and actively blocking the IDPs from reaching safety during a large part of the emergency, UNMISS effectively failed to protect the civilians it is mandated by the UN Security Council to protect. The rigid structure of the UN integrated mission within the PoC site prevented an efficient emergency response, as the strong reliance that humanitarian organizations had on the UN security apparatus and its recommendations for security meant that they could not be mobilized and thus assist in the humanitarian and medical emergency response. This resulted in a short yet acute emergency gap during the peak of the incident, where the emergency response capacity of those present in the PoC site could not be counted upon. MSF’s medical response to the crisis was timely, relevant, and effective. MSF took the lead in the emergency response and was able to act when many others couldn’t. It treated many patients and provided refuge for the IDPs in its hospital. The team, and most notably the national staff, showed a dedicated commitment to the emergency response. The need for better emergency preparedness and more efficient and dignified management of dead bodies are among the lessons learned by MSF from the incident. The circumstances surrounding the death of the two MSF staff need to be further investigated. Worryingly, there are no signs, four months after the events, that the UN is taking steps to improve the situation in the PoCs or admit its mistakes in the February events. The UN under-secretary for peacekeeping operations has recently announced that the findings of the two UN investigations conducted will shortly be made public, and we urge the UN to delay no longer. You can read the full report on pdf document.